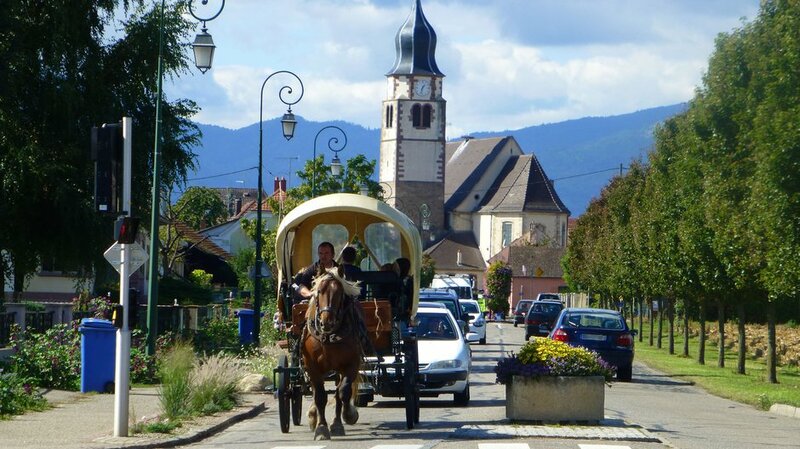 In which we review ‘Qu’est-ce qu’on attend?‘, Marie-Monique Robin’s wonderful new film about Transition in the village of Ungersheim. Ungersheim, the star of this new film by Marie-Monique Robin, is a village in the Alsace in north-eastern France which is home to a remarkable Mayor, Jean-Claude Mensch, to some extraordinary people doing extraordinary things, and to an experiment in what Transition can achieve, one that is increasingly attracting attention from around the world. Robin is a French film-maker of considerable reputation, having already made films such as The World According to Monsanto and Sacred Growth. We spoke to her recently about why she made this film, you’ll find that interview here. The film is currently being screened across France and being very well received. ‘Qu’est-ce qu’on attend?‘ follows life in Ungersheim across the space of a year. It picks out certain key characters in the story, and we revisit them throughout the film. We visit the Passivhaus co-housing project at different stages of its construction, various food-growing projects at different points in the growing season, community renewables projects at different points in their evolution. We follow the couple who are growing rare varieties of wheat and other grains for their artisan bakery through the whole growing cycle, from seed to loaf. [Note to UK readers: imagine if in The Archers, their Transition story line had continued and evolved, and you were tuning in 5 years later … this film is a bit like that]. We see how much of what happens is driven by the infectious enthusiasm of the Mayor, Mr Mensch. He plays a role in this film that many in political office could learn much from. His leadership is visionary but also intensely practical. As well as enabling many of these projects and carrying out the other duties of office, he is also a regular feature of most of the 21 projects he has initiated (“21 projects for the 21st century”), popping round to help with deliveries, helping out at harvest time, dropping by to check it’s all going ok. We see the village meetings where he facilitates others to step up and take ownership of different aspects of the process. We see the pressure it leaves him under sometimes, and he is candid about this not being easy, not being a process which has the active support of 100% of those in the town, and the struggles associated with that. Yet his vision of making Ungersheim “an island of shared happiness” is palpable. What has been created in Ungersheim is a laboratory, and the initial results from the experimentation are very encouraging. Transition, since it arrived in Ungersheim, has created over 100 jobs and led to cuts in CO2 emissions of around 600 tonnes. But it has also done something much deeper. It has changed what people feel is possible, has changed their sense of connection with each other. As one person says in the film, “alone, nothing gets done”. The story of Ungersheim is as much about the meetings, the shared meals, the young couple who fell in love with each other while working in the market garden, the people who had previously felt isolated and now feel like they belong, as it is about Transition. If you are looking for an antidote to the “Epidemic of Loneliness”, there is much to learn from this film. One aspect of the transition in Ungersheim which really fascinates people is the role of working horses. The village sold the school bus and bought a horse instead. The horse takes the village kids to school by carriage, then works in the fields or in the woods, before then coming back to take the kids home. The young man who is overseeing the building of a local food infrastructure in Ungersheim, and who works with the horses on a daily basis, states in the film that such work brings “a tangible modification of our relationship with time”. One of the reasons ‘Qu’est-ce qu’on attend?‘ is so fascinating is that we are seeing so many of the myths underpinning our culture being clearly, gently and charmingly revealed to be just that, myths. You can’t do economic growth without surrendering control to extractive industries, right? Wrong. Citizens should trust the market to meet its needs, right? Wrong. The increasing atomization of society, the increase in individualism, is inevitable, right? Wrong. In its gentle, slow, delightful way, this film unpicks and undermines the idea that There Is No Alternative, showing that actually there very much is. Ungersheim is a powerful tale because it is one of renewal. Ungersheim was a potassium mining area, with an economy hit hard with the closure of the mines. Jean-Claude Mensch himself worked in the mines for 35 years, and sees what’s happening there now very much in that context. It’s a story that will resonate with other places in a similar predicament. This is quite a long film, at just under 2 hours. But at no point was I bored or fidgety. It is not a film of high drama, rather an immersion in a story, a story with characters who are fascinating and delightful. As with Transition at its best anywhere, you see change happening around you, you see ideas moving towards being realized, you see the sense of possibility that starts to emerge. You see the emergence of a collective sense of purpose, and deep delight that comes from relearning how to work with other people. 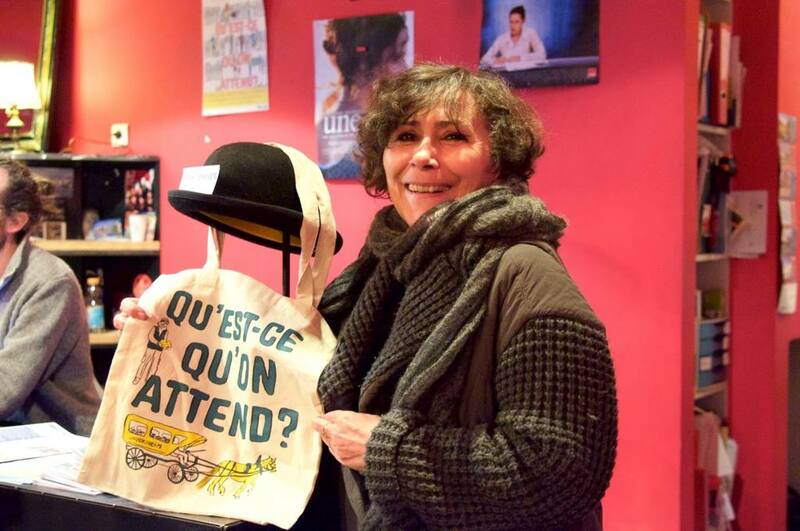 Marie-Monique Robin at a recent screening of 'Qu'est-ce qu'on attend'. I make a brief appearance near the end of the film, basically wandering around visiting lots of projects and saying “wow!” a lot. It really is a profound honour to have had some kind of a hand in shaping an idea that has led to what is underway in Ungersheim. “But there’s nothing here” the Chinese (truck driver) objected. “Only mountains, a lake, and it’s so high”. Precisely, I thought. A mountain. A lake. So high. One could easily say something similar about this film. It’s just a village. Just a Mayor. Doing Transition. So replicably. And all of our lives are so much richer as a result. If you would like to organise a screening please contact M2R Films directly at contact@m2rfilms.com. Cyril Dion on ‘Demain’: “My message to the Transition movement would be a huge thank-you”.